Few districts in Lima have the style of Miraflores, where tradition and history go hand in hand with the important cultural, commercial, entertainment and financial centres. 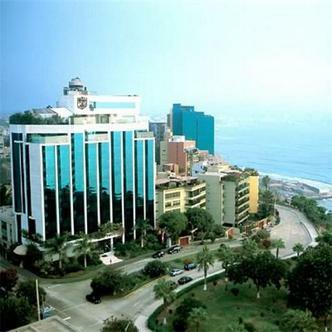 The Miraflores Park Hotel is a boutique hotel distinguished by its subtle elegance and excellent service, ideal for the most demanding traveler, whether on business or pleasure.Our 81 rooms are well appointed, offering ideal space for work and relaxation, most with a marvelous ocean view. All feature ample marble and granite bathrooms, comfortable king size beds, air conditioning and spacious closets. All rooms are also equipped with the latest technology: fax, two-line direct dial phones, dataport with instant access to internet and personal computers.A particular feature of the Miraflores Park Hotel is our presidential floor. Three presidential suites with perfect combination of classic style and modern convenience which leisure travelers and business executives alike can enjoy. Each suite offers a living and dining area, jacuzzi, sauna and private plunge pool.Ambrosia Restaurant for superb dining served in a sophisticated and intimate atmosphere. Dr. Jekyll & Mr. Hyde - our quiet, cozy and sophisticated bar offering a wide selection of cocktails and liquors.Three spacious conference rooms: Luxor, Lagash and Damasco, each one providing the latest technology for any presentation.Enjoy the Green Tower facilities: well equipped gymnasium, squash court, outdoor heated swimming pool. There is also a beauty parlour and massage saloon - ask for our special Bath Butler Service upon your arrival.The Business centre provides all the services and equipment to answer every need for personal use, small meetings or conventions. Bilingual secretarial services, fax machines, PC's, access to internet - internet express - notebooks, photocopy service, as well as cellular phone and beeper rental are available.